The essays in this volume of Paideuma have been arranged chronologically by poet, beginning with two essays on Ezra Pound and continuing through H. D., Mary Barnard, and Charles Reznikoff, concluding with several figures associated with the post-war generations that first came to prominence in The New American Poetry. The chronological presentation is not entirely adequate to the material surveyed: the last essay, by Tony Brinkley and Joseph Arsenault, looks at recent poems by Rosmarie Waldrop, Barbara Guest, and Alice Notley, but with a conceptual framework established through close readings of Hegel, Wordsworth, and Wallace Stevens. 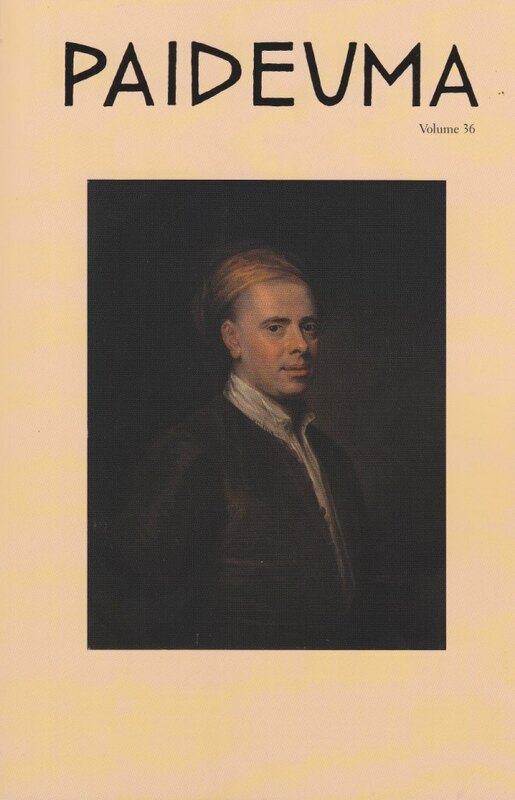 Since the first essay in the issue, by Robert Stark, digs deep into the archive of Scots dialect poetry to illuminate the antiquarian diction of Pound’s earliest poems, the eight essays form a circle of sorts, beginning and ending with the eighteenth century. But the twentieth century is emphatically on display here: as traumatic event for Aimee Pozorski, as material culture for Kaplan Harris, as a confluence of social forces for Andrea Brady. History also informs Patrick Barron’s essay on Edward Dorn’s western landscapes, while Sarah Barnsley discovers a poetics of history in the Imagist landscapes of Mary Barnard and H. D. In Barnsley’s account, poetry becomes “a series of compressed, ground-up moments carrying marks of other moments much as sand carries traces of all contact with rocks and waves.” For Sean Pryor, poetry is instead a series of moments of instruction—vexed and vexing ones, since he is looking at Pound’s late cantos. We are also happy to be publishing seven reviews encompassing primary texts by Ezra Pound and Ernst Fenollosa, and new scholarship on Pound, George Oppen, Black Mountain poetics, and the modernist occult. With this double issue Paideuma shifts to a biannual format (the journal has been a de facto biannual since volume 14), and for the foreseeable future the year’s two issues will be printed together as a single annual. Our primary aim is to streamline the publication process, in order to get the journal back on a regular publication schedule. We believe that this format is best suited to the goal. Note that the date range assigned to this volume brings the current issue in line with the current calendar year. Volume 37 will cover the year 2010 and feature an eighty-fifth birthday tribute to Mary de Rachewiltz edited by Richard Sieburth. We also look forward to publishing in this forthcoming volume essays by Joshua Clover, Evelyn Haller, Sean Pryor, and Jeffrey Westover. We are pleased to announce the publication of Paideuma Volume 36. To order, please visit our main website (here) or click on the Ordering tab of this blog. Sean Pryor‘s “Particularly Dangerous Feats: The Difficult Reader of the Difficult Late Cantos” explores the relationship between the reader and Ezra Pound’s late cantos. The article, which deals with the pedagogical concerns of Pound as expressed by The Cantos, naturally arose “from the always strange but stimulating experience of trying to teach Pound,” as Pryor puts it, especially the later cantos. To offer explanations to the novice whom you have abandoned is to confess an inability to abandon your novice. This is the fundamental tension to which Snodgrass [and others] respond, a clash between the poem’s compulsion to judge and its compulsion to teach. The poem is actually in desperate need of its reader, and that need is often most visible when the poem mocks, abuses, or damns the reader. Robert Stark’s “‘Toils Obscure, / An’ A’ That’: Romantic and Celtic Influences in Hilda’s Book,” takes a look at Ezra Pound’s chewy jargon by examining his predecessors, most notably Robert Burns, Allan Ramsay, and James Whitcomb Riley. While Pound’s “odd spellings are usually calculated…to estrange the reader,” Stark views Pound’s archaisms in Hilda’s Book as a revelatory glimpse into the lexicon of a poet who never truly, even in The Cantos, abandoned these first impulses. This language suggests that Pound is consciously seeking an aesthetic impulse from his subject matter: it powerfully imitates the chirruping of the birds themselves. 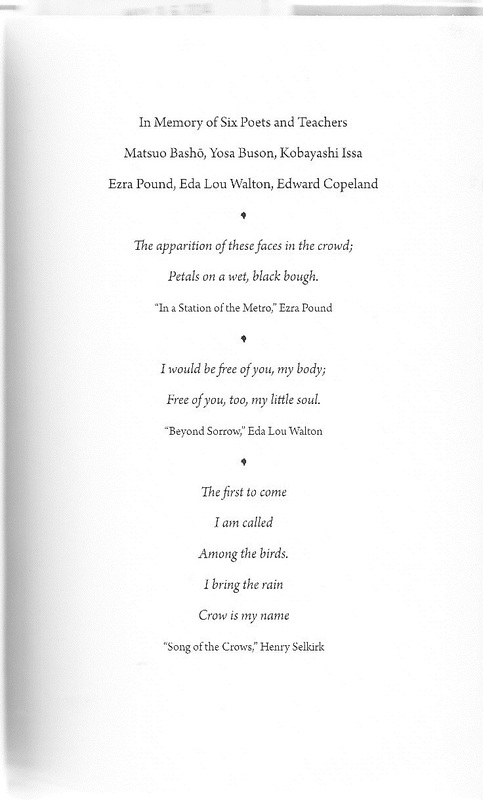 …Though the image might confuse at first, Pound’s usage is consistent with the precise nature and historical development of the language he employs; the special religious sense governs the meaning of the poem subtly and surely, in a vital rather than ornamental fashion. The language and the strange diction conspire to release these songbirds from the spell of Romantic and post-Romantic introspection…and result in a new but tentative poetic register. 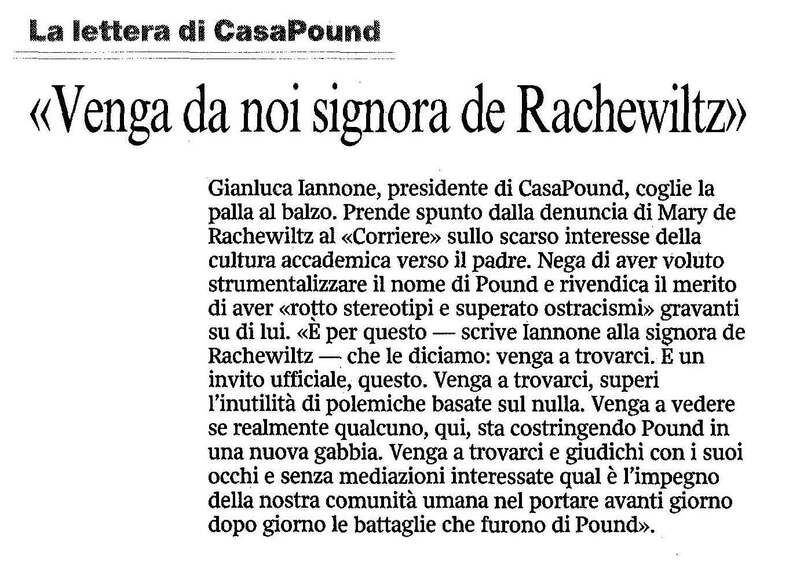 From EPOUND-L, the Ezra Pound Discussion List (hosted by the University of Maine), comes a link to an April 14th story in Corriere della Sera concerning Ezra Pound’s politics. 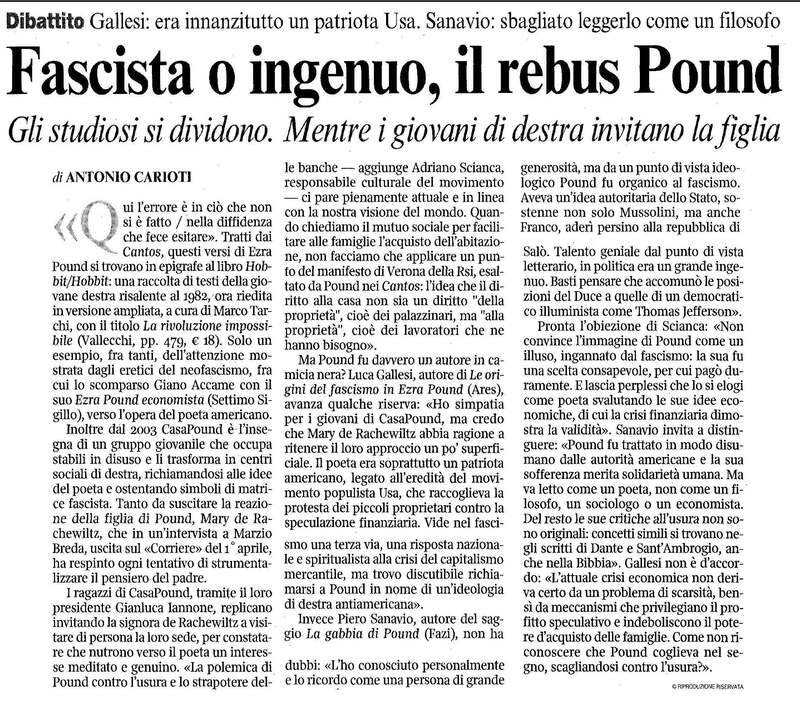 The article is framed as a debate between two Italian Poundians, Luca Gallesi and Piero Sanavio, but the real antagonists are CasaPound (Pound House), a center for extreme-right youth in Rome, and Mary de Rachewiltz, who recently denounced the center’s appropriation of her father’s name. That denunciation appeared in a Corriere story published on April 1st (link); the immediate occasion for the new story was CasaPound’s response, which the paper published as a sidebar. Note, by the way, that CasaPound was also in the news recently for having plastered the city illegally with its political posters (the picture and caption to the right come from an April 8th story; link). The url shared on the Pound list goes to a .pdf of the text as it appeared in print, which we’ve reproduced above — you can see the sidebar at the end of this post; Corriere‘s website also gives a digital version (link). Thanks to Carla Billitteri of the NPF editorial collective, we’re able to offer a quick translation, along with some relevant extracts from the April 1st story. Here and there Billitteri has modified the idiomatic Italian to make the meaning more legible. We’re also thankful to Massimo Bacigalupo for clarifying the context. Debate Gallesi: He was above all an American patriot. Sanavio: It is wrong to consider him a philosopher. “Here error is all in the not done, / all in the diffidence that faltered.” Cited from the Cantos, these verses of Ezra Pound can be found as the epigraph to the book Hobbit/Hobbit, a gathering of texts by right-wing youth dating back to 1982, now republished in an expanded version edited by Marco Tarchi with the title La rivoluzione impossibile (Vallecchi, 579 pgs, €18). As one example among many of the interest in the work of the American poet demonstrated by these heretics of neofascism: the late Giano Accame and his Ezra Pound economista (Settimo Sigillo). Since 2003 CasaPound is the trademark of a group of youth who occupy abandoned buildings and transform them into social centers for the right, harking back to the poet’s ideas and making a show of symbols of fascist origin. They have ignited a reaction from Mary de Rachewiltz, daughter of Pound, who in an interview with Marzio Breda, published in Corriere on April 1st, has rejected any attempt to instrumentalize her father’s thinking. All of which parallels the appropriation of Pound by the Tea Party Movement (noted here last month). Stay tuned for further developments.